The latest violent episode between Palestinians and Israelis has prompted Israel’s Prime Minister Binyamin Netanyahu to assert that Israel is in the midst of a “battle for Jerusalem”. This is a city divided along many lines, and while the latest attack has caused outrage and hostility, it also offers an insight into just how intertwined the lives of the people who live there actually are. The attack took place in West Jerusalem, where two Palestinians entered a synagogue and killed four worshippers. A policeman involved in the fray also died later from his wounds. Outraged Israelis have since warned that a religious dimension has been brought into the wider conflict in the country. In their eyes, the dispute has ratcheted up significantly as a result of the incident. On the other hand, the word on the Palestinian side of the street is that nothing is new here. With the frustration of years of occupation and the failure last spring of American sponsored peace talks, there remain few options for change and even fewer expectations. In a city like Jerusalem, contested by three major faiths, religion has always been at the forefront of conflict. Murder in the act of prayer – as has happened this week – certainly provides a chilling symbolism of the rifts. But religion colours many aspects of everyday life and identity in Jerusalem. The synagogue attack has illustrated how closely the communities are linked, whether they like it or not. The dead policeman, Zidan Saif, was not a Jew but an Israeli Druze, a distinct branch of Islam whose members often serve in Israel’s police or armed forces. His funeral was attended by the President of Israel and a large number of ultra-orthodox Jews. One of the Palestinian attackers worked in a supermarket near the synagogue. The primary flashpoint in Jerusalem is the sacred compound in the Old City, known to Muslims as the Haram al-Sharif and to Jews as the Temple Mount. The religious topography there is meaningful for the current conflict. Islamic structures stand on the Haram today and are used on a daily basis. The Jewish holy places exist primarily in archaeology and memory. Worship focuses on a remaining fragment of the Second, or Herod’s, Temple, known as the Western Wall. A fragile modus vivendi has existed since 1967 that enables Jews to pray below at the Wall and Muslims above on the esplanade. 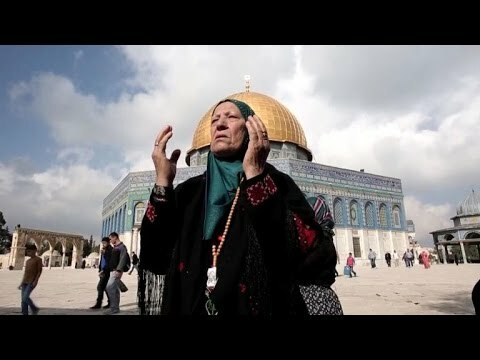 At times of unrest and tension, Palestinians, usually men under 55 years of age, are banned from prayer at the Haram. At the same time, militant Jewish groups push for prayer on the mount. Some of the most radical would like to see the temple rebuilt. This would entail the demolition of the Islamic holy places there. Such a scenario would obviously be met with great anger and hostility by the Muslim world, creating a downward spiral with extremely dangerous global consequences. If recent violent events in Jerusalem demonstrate how far apart the Israeli and Palestinian camps are from each other, the closely intertwined cultures of the holy places demonstrate how much they overlap. The fissures in Jerusalem take place at a micro-scale that can easily escalate into problems of world significance. It is a city of fragments and paradoxes that exceed any simple divisions and elude attempts for settlement. It is a city that has been at war with itself for many years. The recent incidents constitute just the latest sad chapter in what is a long, violent history. Wendy Pullan has received funding from the Economic and Social Research Council (ESRC). She is co-author of The Struggle for Jerusalem’s Holy Places (2013).